Walked out into the dark morning with the horizon gently filtered by a soft hazy fog. The first few kilometres were a painful hobble as my right iliotibial band and knee were aching, probably because of overcompensating for my left ankle which is almost frozen immobile from tendinitis, arthritis, shin splints or a possible stress fracture. Okay, that may be a slightly incompetent diagnosis but it makes me seem more stoic by soldiering on with a stress fracture rather than merely a sore ankle. Before long there was a 25 minute steep climb which worked wonders for my ankle - go figure - it was almost as good as a physiotherapy session. I don´t know if it was the angle of the incline or the front of my boot massaging the ankle but once I got to the top it had loosened up enough that I could walk with ease. Huh! The walk across this part of the Meseta was spectacular; silent, serence and endless and endless in a zen kind of way. The tranquility of the Meseta makes me aware of just how out of touch with world events at the moment. It is quite an indulgence to start each day with walking rather than with caffeine and the newspaper. At the moment, I don´t meet the day heartsickened over a missing child, frustrated and depressed over the plunging economy and my equally plunging life´s savings, hardened by the devastation and loss caused by another misguided suicide bomber or saddened by yet another Canadian soldier who has lost his life or limbs to an IED, not to mention the insane carnage by ´drinking and driving or speeding on our freeways. It may be somewhat of an óstrich´mentality but for the moment that is okay. We got to the municipal alberque at Fromista, a spacious well-equipped hostel. The rooms are big enough and again it´s always a bonus to have separate gender facilities for showering and whatnot. We were a little disappointed because Suzanna (our Korean Fashion Designer tenured Professor) had promised us a Korean curried fried rice dinner but it will have to be tomorrow. It´s almost like a Camino reunion as the French Canadian men have just arrived, Suzanna is here, Gin and Julia (both young Korean girls) as well as Son and James Kim. The wear and tear of the daily physical challenges are starting to take their toll. James has had such bad shin splints that he went to the medical centre and has been told not to walk for a few days. That means he has to take a taxi each day (22Euros a time) for the next couple of days. Gin´s backpack straps have broken, a pack she just bought three days ago in Burgos. This put a lot of extra stress on her carrying the bag and so she too is limping. Another your Austrian girl with shin splints decided to walk only 12km (only! - that´s considered taking it easy on the Camino. 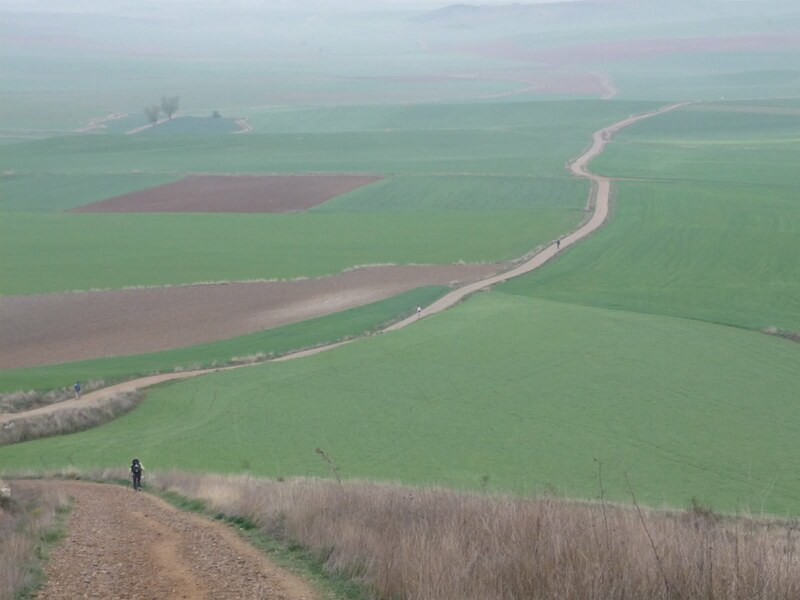 We have another three days to enjoy the Meseta and we´re hoping the rain holds off. It is so much easier when the weather is dry. We are sticking to the guidebook for the Meseta just to make sure we don´t get stranded in the middle with 17km to find a place to stay. Getting to an alberque before noon also means we have time to recuperate.